The path between technology discovery and commercialization can be so treacherous that it has been dubbed the ​“Valley of Death.” Not all products survive the test — and batteries are no exception. In the Materials Engineering Research Facility’s process research and development lab, Argonne chemist Trevor Dzwiniel sets up a reaction calorimeter, which precisely measures how much heat a chemical reaction generates. This vital information is used to assess the scalability and safety of a reaction or process. “A superior material discovered at the bench scale does not necessarily predict successful outcomes at the industrial scale,” explains Greg Krumdick, an engineer at the U.S. Department of Energy’s (DOE) Argonne National Laboratory. This poses a problem for scientists, like those participating in Argonne’s Energy Storage Research Initiative, who are looking to develop commercially-viable batteries from fundamental materials research. Cue Argonne’s new Materials Engineering Research Facility (MERF) — using its state-of-the-art labs and equipment, researchers can safely determine fast and economical ways of producing large quantities of advanced battery materials for commercial testing. The MERF was established because DOE recognized the need for a facility that could help expedite the transfer of advanced battery materials from the bench to industry. Though current projects in the facility are focused on the development of advanced batteries for vehicle and grid storage applications, the MERF can support scale-up projects for any type of material. Much gets lost in translation when a bench-scale synthesis is tried at a larger scale — factors such as reaction timing, heat transfer and mixing velocity can change in a non-linear manner. At the bench, scientists synthesize small samples on the order of hundreds of grams. Though this lets researchers quickly and efficiently find the properties they are targeting, bench-scale processes often do not work on an industrial scale — which is where the MERF comes in. Experiments can keep researchers on their feet all day long. Process R&D chemist Kris Pupek moves between fume hoods in the Materials Engineering Research Facility’s process research and development lab, while lab-mate Trevor Dzwiniel records data in his notebook. MERF is the only facility at Argonne that has H-occupancy rated labs approved to handle the large amounts of hazardous chemicals required for scale-up experimentation. The space meets rigorous standards set by the International Building Code and National Fire Protection Association. Features like trench drains, high-efficiency particulate air filters, specialized ventilation appliances, fire-resistant separations and an abundance of sprinklers equip the space to handle high volumes of chemicals that might be toxic or flammable. MERF’s 10,000-square-foot space accommodates the entire scale-up process, from fundamental process research and development, to industry-ready process scale-up, to post-production analysis of scaled-up samples. Currently, the facility contains bench-top pilot labs, walk-in pilot labs, high-bay spaces and a dedicated analytical lab. Researchers start their scale-up research in the process research and development lab. With five bench-top fume hoods, the space is designed to handle a generous volume of work. Researchers can have a number of different experimental setups operating simultaneously to speed up the development process. Following small-scale experimentation, researchers carry out their next steps in large walk-in hoods in the process scale-up lab. These labs are sized to contain up to 100-liter reactors and designed to cater to a constantly changing flux of experiments. Much of the equipment is portable, allowing researchers to rapidly change out complex experimental setups. The high-bays host the largest-scale work. These 32-foot-tall spaces can hold oversize equipment such as large reactors, distillation columns or spray dryers. Every high-bay has a 5-ton bridge crane to move heavy apparatus. Adjoined to each lab is a control room that allows researchers to monitor their experiments. Argonne material engineer YoungHo Shin prepares a coin cell battery in a glovebox in the Materials Engineering Research Facility. Once it is prepared, the battery can be tested to determine the energy output characteristics of a cathode material for lithium-ion batteries. Also located within the facility is a fully equipped analytical lab that allows for the immediate evaluation of synthesized organic or inorganic materials. Analytical chemists can use the lab’s state-of-the-art instruments to determine whether scaled-up materials have the same properties as their original samples and generate a quality assurance report to accompany samples sent to industry for evaluation. Direct access to these tools expedites the scale-up process, since scientists do not have to send samples away or go off-site for analysis. Current DOE-funded projects at the MERF are looking to scale up battery electrolyte and cathode materials. Argonne researchers have already successfully scaled up many materials and have provided numerous samples to industry for evaluation, including the synthesis of several redox shuttles that keep lithium-ion batteries from overcharging. The MERF also supports direct collaborations between Argonne and industry. The facility meets Argonne’s standards for business and environmental practices, which follow quality and environmental management certifications set by the International Organization for Standardization. In addition, with access to each lab controlled by card key access, companies can be assured that their proprietary information remains secure. With the Materials Engineering Research Facility’s state-of-the-art labs and equipment, Argonne researchers can safely scale up materials from the research bench for commercial testing. Photo courtesy Argonne National Laboratory. 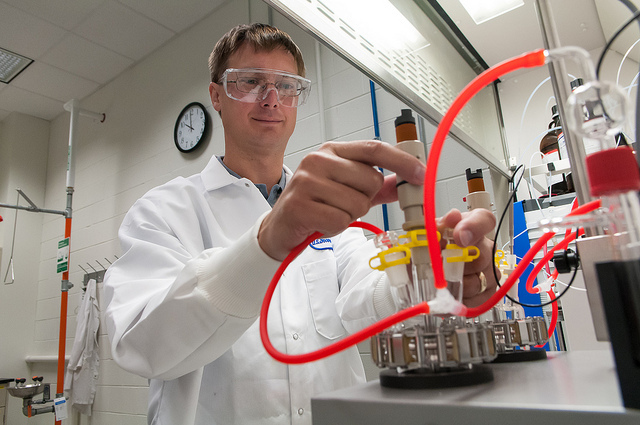 Process R and D chemist Trevor Dzwiniel prepares a 20-liter jacked reactor for large-scale preparation of electrolyte materials for lithium-ion batteries. Experiments can keep researchers on their feet all day long. Process R and D chemist Kris Pupek moves between fume hoods in the Materials Engineering Research Facility’s process research and development lab, while lab-mate Trevor Dzwiniel records data in his notebook. In the Materials Engineering Research Facility’s process research and development lab, Argonne chemist Trevor Dzwiniel sets up a reaction calorimeter, which precisely measures how much heat a chemical reaction generates. Chemical purity is a crucial parameter for battery-grade materials. Argonne chemist Kris Pupek loads a sample onto a high-performance liquid chromatography instrument in the Materials Engineering Research Facility’s process research and development lab. Argonne chemist Kris Pupek adjusts the stirrer speed of a 20-liter reactor in a walk-in hood in the Materials Engineering Research Facility’s process scale-up lab. These reactors are used to prepare large quantities of electrolyte materials for lithium-ion batteries. Argonne process R and D chemist Kris Pupek records the process parameters off a large filter and dryer unit in Argonne’s Materials Engineering Research Facility. In the Materials Engineering Research Facility’s analytical lab, Argonne analytical chemist Gerald Jeka adjusts a nitrogen tank in preparation for a procedure used to determine the ratio of key elements in cathode materials for lithium-ion batteries. Argonne analytical chemist Gerald Jeka loads a sample on to a gas chromatograph-mass spectrometer in the Materials Engineering Research Facility’s analytical lab. Argonne researcher Mike Kras loads a sample into a thermogravimetric analyzer (TGA), which tracks changes in the mass of a sample as a function of temperature and time.